Enjoy fun for the whole family by taking a Dolphin Discovery tour that lets you touch and swim with the dolphins who are enthusiastically awaiting your arrival. Learning about marine life has never been more fun with our educational, interactive tours that allow you to experience the wonder of these mammals firsthand. If you're looking for a vacation activity that's perfect for the whole family, then look no further than Dolphin Discovery at Gulf World in Panama City Beach, Florida. Florida is known for its gorgeous beaches and marine and sea life, so why not learn a bit more about that marine life and get closer to it by going on a tour with the dolphins? Dolphins are beautiful, friendly and lovable creatures, and adults and children of all ages can enjoy interacting with them on this family-friendly tour. Our Dolphin Royal Swim tour not only provides you with the opportunity be hands-on with the dolphins, but it also allows you to interact with them in a manner that you wouldn't be able to experience otherwise. For instance, get a kiss and hug from a dolphin or give them a handshake. You can even engage in the famous dolphin foot push that consists of two dolphins pushing your feet to propel you upward out of the water. Additionally, you can even catch an exhilarating ride on the dolphins by grabbing their dorsal fins and allowing them to pull you along through the water. Included in the price of your tour are plenty of other activities for you to engage in as well. You’ll enjoy watching the educational dolphin show that teaches you more about these interesting and wondrous animals, the sea lion show that educates you all about these kings of the sea, and the Friends and Furry show that lets your learn about a variety of animals native to the Panama City, Florida area. While we're all about having fun at Dolphin Discovery, we want to ensure that you are safe as well, and that's why we have a few rules and regulations that our tour guests must adhere to. 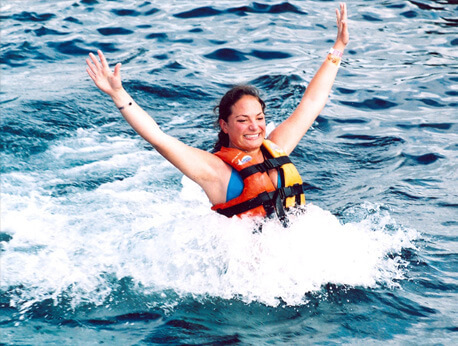 We require that all tour participants wear a lifejacket for their own safety and that children be at least 3'11" tall in order for them to participate in our dolphin tour activities. We also ask that all our tour participants be able to speak and understand English to ensure that they understand all of our instructions. Adults are 4'7" and up. Approximately 45 minutes (15 minute introduction and 30 minutes in the water). For safety reasons pregnant women can't participate in the Royal Swim program.